I realize I’ve baked a ton of Chocolate & Peppermint stuff this week but this is the time of year when it makes perfect sense to overuse it. I made a batch of these brownies for friends of ours, we are going over their house for a visit on Christmas Eve and I wanted to give them a sweet treat as a gift. Essentially there are 3 “layers” to this brownie, they are easy to make and they are so moist and rich & chocolaty. You will want to make an extra batch of these & share! These are best kept in the fridge nice & chilled, remove about 15 minutes before serving. Heat oven to 350. Grease 13x9x2-inch baking pan. Line pan with foil or parchment paper then grease for easy removal and cleanup. Stir together cocoa, baking soda in a large bowl; stir in ⅓ cup butter. Add boiling water; stir until it thickens. Stir in sugar, eggs & remaining ⅓ butter; stir until smooth. Add flour, vanilla & salt; blend together. Stir in chocolate chips. Pour into pan. Bake 35-40 minutes. Cool completely in pan on wire rack. When brownies are completely cooled, frost them and put brownies in the fridge to chill while you crush all the candy canes. Put the butter and chocolate chips in a microwave safe bowl/dish. Turn on high and melt in 30-40 second intervals. Glaze is ready when it is completely melted and smooth. Let it cool for a few minutes and remove the brownies from the fridge. Pour the chocolate over the brownies, move quickly as this will soften the chilled frosting. Make sure the chocolate is spread evenly over the brownies. 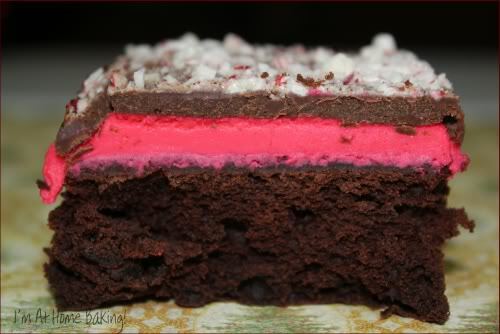 Sprinkle the crushed candy canes over the top of the brownies and return to fridge. It seems like it is a lot of work, but I promise you it is worth it. Keep these brownies in the fridge, let them rest at room temp for 15 minutes before serving. The amount of brownies you get depends on the size you cut them. To cut these brownies easier, take your knife and run it under very hot water for about 30 seconds, dry off quickly with a paper towel and then cut the brownies, should slice threw them like butter. These look luscious! I haven’t had enough chocolate and peppermint…I may make them for Valentine’s Day!